In communities throughout the Palestinian Authority in the West Bank, a surprising degree of luxury exists alongside the poverty. This study By The Jerusalem Center, November 5, 2015 , includes “A Photo Album of Palestinian Luxury in the West Bank,” offering a more complete picture of living standards there. The truth is that alongside the slums of the old refugee camps, which the Palestinian government has done little to rehabilitate, a parallel Palestinian society is emerging. There is also some versions of Sinai option created by outside NGOs such as “The Institute for the Study of Globalization and Covert Politics”, which might have conspiracy theoretical approach on issue. Anyway ISGP proposes that under United Nations and NATO supervision and with financial support of the world community, humanely transport ALL Palestinians from the West Bank to a newly-created Palestinian state consisting of the south of Israel and preferably a small part of Egypt’s largely uninhabited Sinai Desert. In order to help make Palestine a viable state, extend its borders from Gaza on the Mediterranean Sea to the Red Sea. Already 2012 then Defense Minister Ehud Barak said that Israel should consider imposing the borders of a future Palestinian state, becoming the most senior government official to suggest bypassing a stagnant peace process. Maps can be a powerful tool in geopolitics and information war for example by de-legitimising some country or even wiping its existence from schoolbooks; at least conflicting maps can lead to confusion about situation on the ground, mistaken map can even create a security risk. 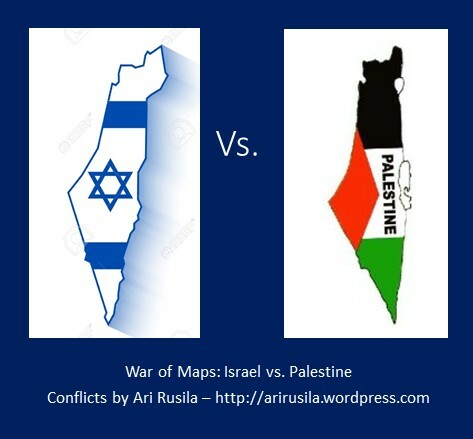 Few opposite examples related to Israeli-Palestinian conflict may clarify this “map-war”. 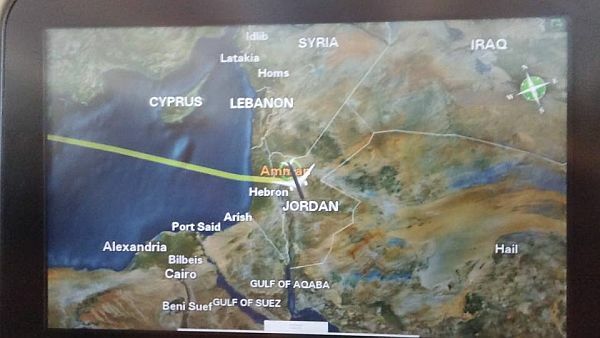 According The Times of Israel [August 19, 2015] Israel is not on Royal Jordanian’s map, Photo below was taken of the on-board map on a Royal Jordanian flight from New York to Amman in the past week. Royal Jordanian, the country’s national carrier, flies a regular route from Tel Aviv to Amman, a particularly popular option for Israelis wishing to connect with RJ flights to the USA and elsewhere. 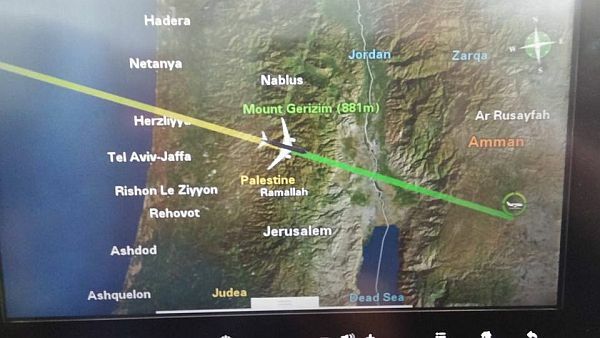 In 2009, British Midland International Airlines, a subset of British Airways, apologized for omitting Israel from their in-flight maps, also attributed to a technical error. Related to travel but not exactly to maps The US Department of Transportation was preparing in January 2015 legal action against Kuwait Airways should it refuse to end its practice of discriminating against Israeli passengers flying to and from the United States (e.g. one Israeli-American was denied by the airline a ticket from New York to London in 2013). Dutch restaurant owners cited their gastronomical focus in explaining why they had replaced Israel with Palestine in a map of the Middle East they had printed. The owners of Le Souq, a restaurant based in Rotterdam that specializes in food from the Middle East, offered the explanation after a local politician criticized their removal of Israel and replacement with Palestine in the restaurant’s signature place mat, which features a map of the Middle East. “A new country in the Middle East? In Rotterdam’s market hall they are straightforward about Israel’s position. Bizarre,” Jan Hutten, a regional chairman of the center-right Christian Democratic Appeal party, wrote on Twitter earlier this week. He also included a picture of the controversial place mat. 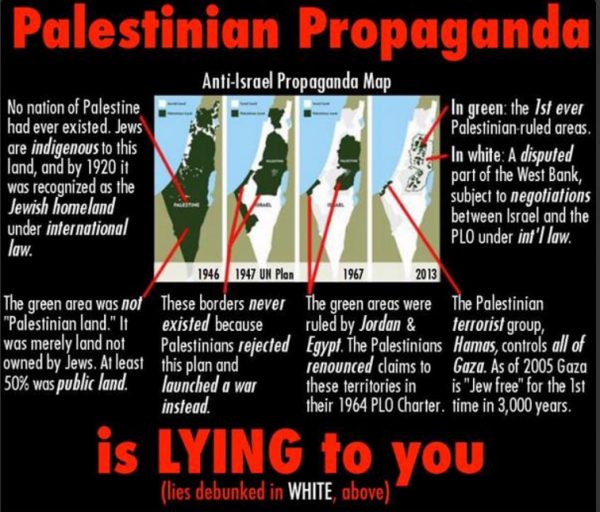 1946 map is lie: By the early 1940s Jews owned about one third of private land in Palestine and Arabs about two-thirds. The vast majority of the total land, however, belonged to the government, meaning that when the state of Israel was established, it became legally Israel’s. Of course, before 1948 the word “Palestinian” more often than not referred to Palestinian Jews, not Palestinian Arabs. For example, the Palestine exhibit at the 1939 World’s Fair was entirely Jewish, the Palestine Orchestra was entirely Jewish, the Palestine soccer team was almost entirely Jewish, and so forth. 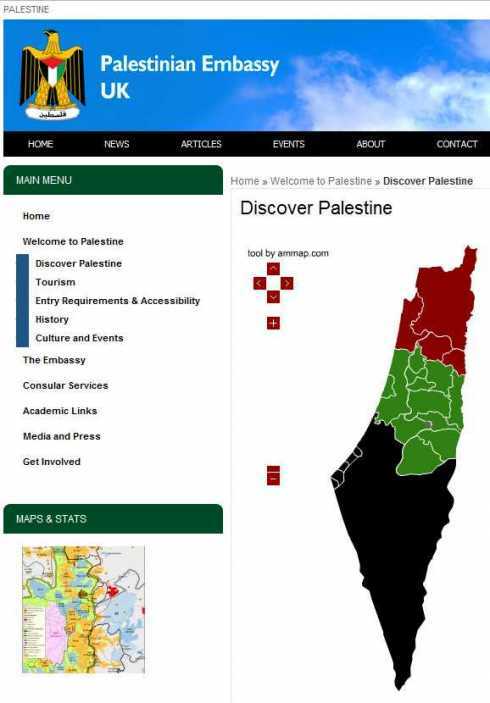 This map is not the territories … the map fails to distinguish between land that is owned by Jews or Palestinians, and land that is controlled by Jewish or Palestinian political entities. Take the vast triangular tract of land at the south of the map. That’s the Negev desert. Apart from a few small oases, kibbutzes and towns, it’s empty wasteland; it isn’t owned by anyone. It represents almost half of the territory of Israel/Palestine. On 19th Oct. 2015 MSNBC apologized for using “not factually accurate” maps in a segment discussing the violence that has erupted across Israel. 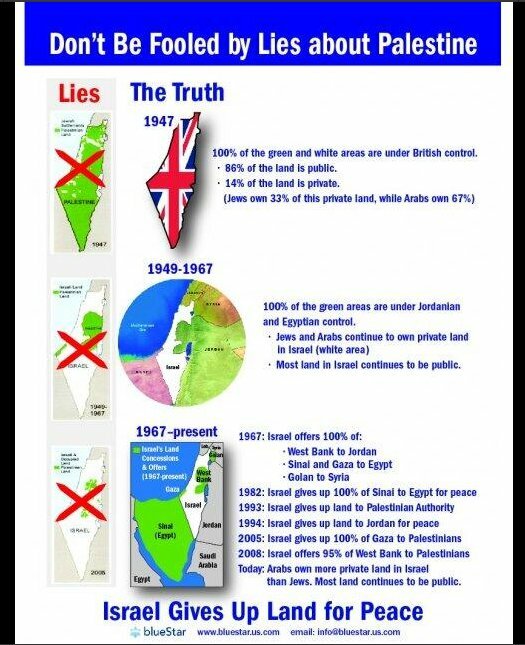 On the other side some maps from Israel are not factually accurate either or at least they give the wrong impression about situation on the ground. During my last visit in Israel on Summer 2015 I got ‘official’ touring map of Israel. 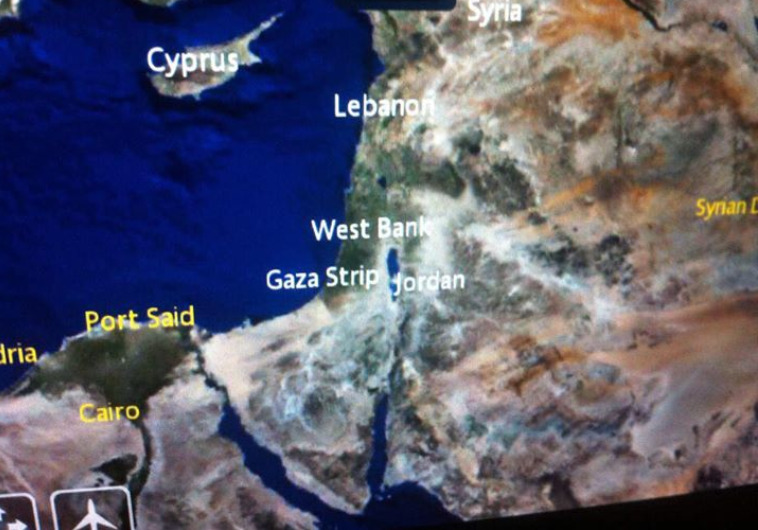 The map is quite good detailed but one hardly can see any boundaries in Judea & Samaria (aka West-Bank). Especially during clashes and violence I think that it would be appropriate to show clearly A, B and C Zone boundaries for security reasons as different authorities are responsible about security in different zones. 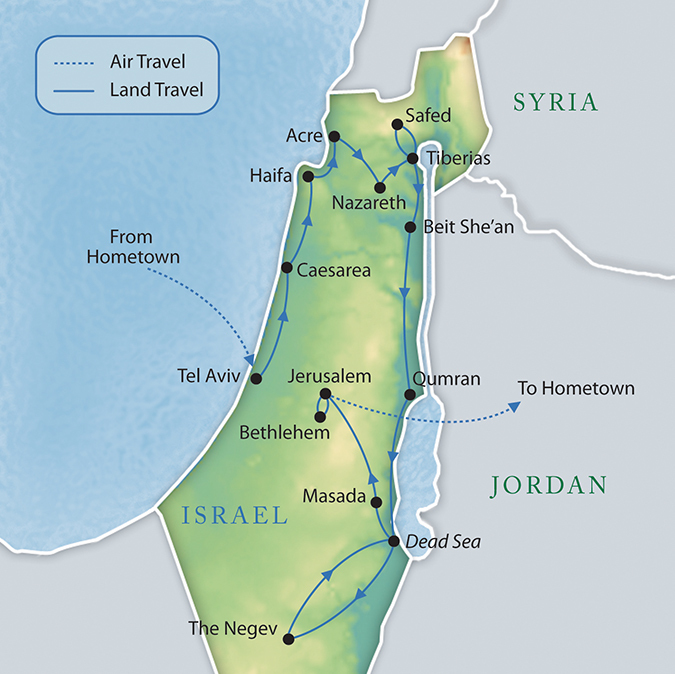 One other example from Israel: One of the leading global luxery travel operators Travcoa – part of TUI Group – is selling its “Mystical Israel” 12 days luxery tour with map below where one can not find Palestine or even Gaza. One more example from Sweden, a country wich decided to regognize Palestinian state. In Swedish based Railway bulletin I saw following map included to news related to new railway in Israel. 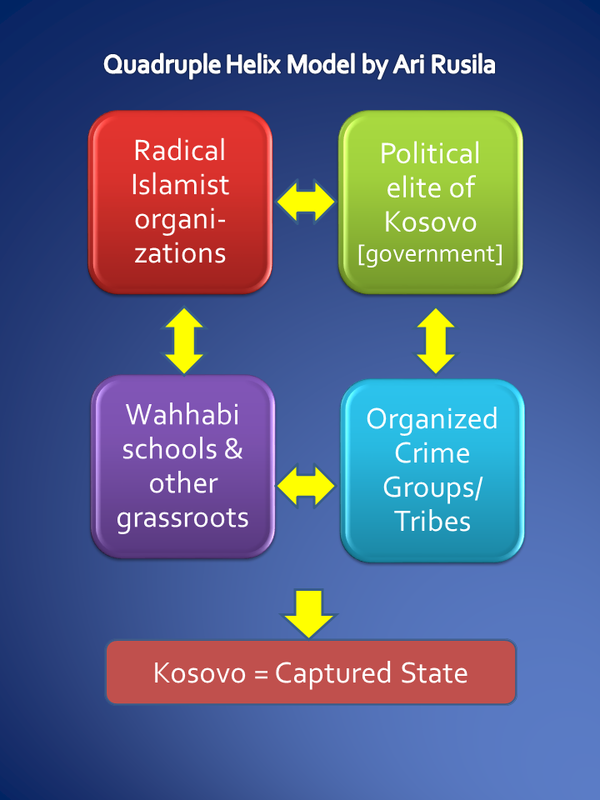 One can understand that maps can be used as part of propaganda by different interest groups. Maps can be printed to t-shirts, posters, mugs etc to express strong provocative view of one party, they can be modified to send clear message and in my opinion there is nothing wrong with that. However examples earlier in this article are implemented by normal private companies or public organizations which primary aim is to provide profits to owners so the unintended consequences of their maps can be propagandist too. 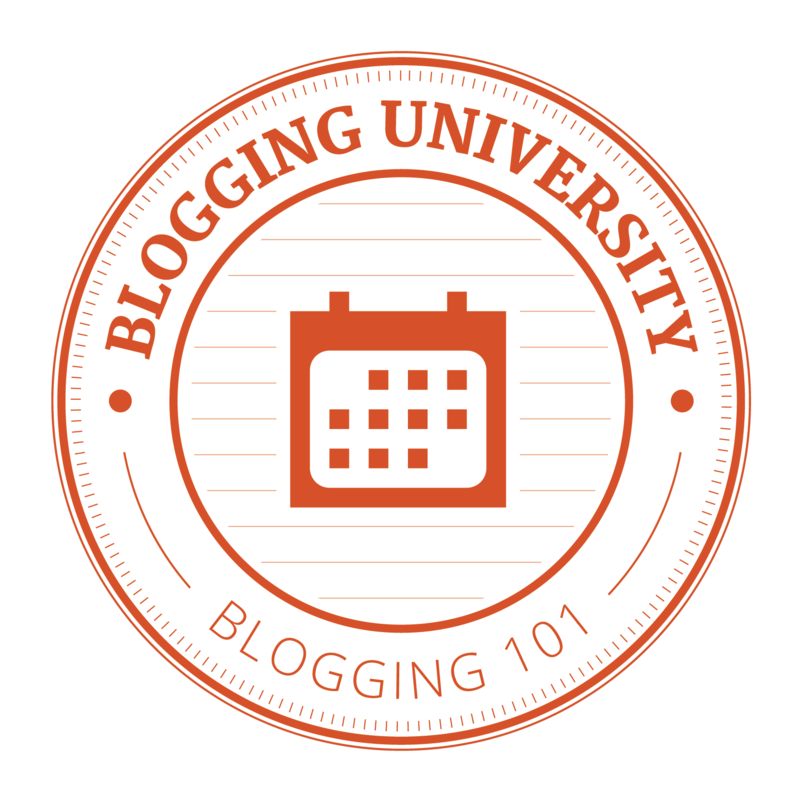 You are currently browsing the Conflicts by Ari Rusila blog archives for November, 2015.